Hillary Clinton is raking in donations from Wall Street, and her attempts to downplay it are under fire. Bernie Sanders and Martin O'Malley both hit Clinton hard for her Wall Street ties in Saturday night's Democratic debate. Clinton responded with this claim: "I think it's important to point out that about 3% of my donations come from people in the finance and investment world. You can go to OpenSecrets.org and check that. I have more donations from students and teachers than I do from people associated with Wall Street." The audience applauded, but factcheckers were quick to challenge it. CNN's Reality Check Team called the claim "false," and Martin O'Malley's campaign dubbed it "one of the most glaring false statements of the night." On Monday, OpenSecrets.org added its thumbs down. It says Clinton's Wall Street cash is actually 7.2% of the total -- more than double what she stated in the debate. "Hillary Clinton, thank you for using OpenSecrets. Next time, just call us, maybe," wrote Will Tucker of OpenSecrets in a blog post. Here are the numbers: Clinton received $2 million in itemized contributions from Wall Street (listed as "Securities and Investment"), out of a total of $77.5 million. That works out to just under 3%. OpenSecrets acknowledges that Clinton's claim is "technically right," but it says that's bad math. First, when talking about Wall Street, OpenSecrets says it's appropriate to add contributions from commercial banks as well. That brings Clinton's Wall Street total to $2.5 million. But the bigger flaw in Clinton's math is that it doesn't include any donations to super PACs, the political action committees that can raise and spend unlimited amounts of money. This is important because Wall Street is the second highest contributor (behind only Hollywood) to super PACs that have said they are supporting Clinton and only Clinton. Clinton's Wall Street haul jumps to $6 million when super PAC money is included. According to OpenSecrets, Clinton's Wall Street donors make up 7.2% -- not 3% -- of her fundraising because that's what you get when you divide $6 million by $83 million (the total for Clinton campaign contributors + Clinton super PAC money - small donors that Open Secrets can't trace). The other part of Clinton's claim is that students and teachers have given her more. According to OpenSecrets, people who work in the education field donated just under $2 million. That suggests Wall Street gave more, no matter how you look at it. But the Clinton campaign provided its data to CNNMoney to argue that teachers are bigger Clinton backers. The key is small donors -- people giving under $200. Campaigns don't have to report the names and information for donors giving under $200, and small donors make up a sizable amount (about 17%) of Clinton's fundraising. According to the Clinton campaign, Wall Street donors (big and small) have given a total of $2.4 million while teachers and students have given "just over $3 million." But again, those totals do not include super PAC money. OpenSecrets also doesn't usually count students as being in the "education" industry since their income doesn't typically come from education. Students have given over $834,000, according to campaign data shared with CNNMoney. 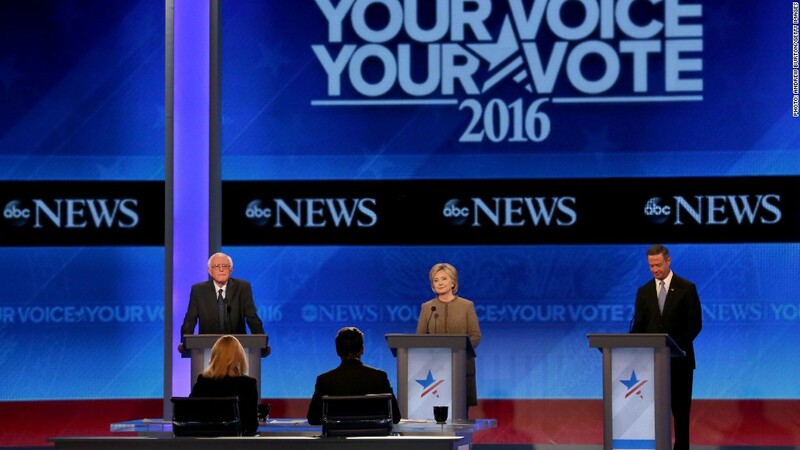 How to regulate Wall Street has become one of the most divisive issues in the 2016 Democratic primary race. Sanders and O'Malley want to break up the big banks and bring back a law known as Glass-Steagall. It was in place from 1933 until 1999 -- when President Bill Clinton and Congress repealed it. The act essentially forced banks to chose between serving Wall Street (think: trading, mergers and deal making) or serving Main Street (think: taking deposits and doing home and small business loans). "The CEOs of large multinationals may like Hillary. They ain't going to like me and Wall Street is going to like me even less," Sanders said on Saturday. Hillary Clinton argues that Glass-Steagall is a blunt tool that doesn't make sense for today's banking world. She has put forward what she calls a tougher solution to put the brakes on Wall Street. But Wall Street responded to Clinton's plan with mostly a shrug. As Jaret Seiberg of Guggenheim Partners wrote in a note to clients, "We continue to believe Clinton would be one of the better candidates for financial firms."